Mr Ajay Piramal: Good morning. Let me give you a very warm welcome. It’s pretty early for Mumbai standards, and that all of you are here. I am sure we are going to have an exciting few hours in the morning. I consider it a great privilege to welcome His Holiness Radhanath Swami, Kishore Biyani, Govind and all of you. It’s a very interesting session that we have on ‘Spirituality and Leadership’ and there couldn’t have been a better person to talk about it than Swamiji (Radhanath Swami). Swamiji (Radhanath Swami) has had a very interesting career. He was born in the US, born in a Jewish family. And till the age of nineteen had never stepped out of the US, when truly there was an inner calling that he had to go to find his true meaning in life. He just took off from the US. 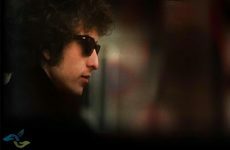 At that time in the seventies – early seventies – when you know there was a lot of turmoil going on in the US, whether it was the whole issue of the Vietnam War, it was about drugs and there was a lot of dissatisfaction in the society. He travelled without any money in his pocket, not knowing where to go, and ultimately found his true calling in India. His journey through that period is fascinating and I just saw copies of that book outside – ‘The Journey Home’. And I would recommend that you have a go through that, because it talks about the real you. You will understand what Swamiji (Radhanath Swami) has been, the real him – the challenges that he faced in his life, the near death experiences. Remember, if you travelled in those days, it was not easy as it is today. You travelled really by road because if you don’t have money and you come from US, people think that you have a background that you are probably a drug or a hippie. How these near death experiences, whether it was in Turkey, in Kabul, in Nepal are all very interesting. Since then Swamiji (Radhanath Swami) has devoted his life to spread the message of bhakti, not only in India but all over the world. He talks and spreads this knowledge across various segments of people, from the top leaders of the world to all of us. 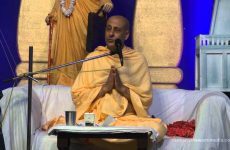 And we are really honored that you have come today Swamiji (Radhanath Swami). Kishore Biyani is really the father of modern retailing in India. Whenever I need to understand what’s happening in the country, in terms of what the real consumer thinks, there is no better person who’s better informed than he is, because he is constantly in touch with people. He believes his office is more on the shop floor than in his office complex. We are really happy that he is here today. And Govind, as many of you must have seen him on TV for many many years. We miss you now on TV Govind, but still very well informed and a very good anchor. So with this I am not going to stand too much between the discussion and you. We start off the discussion and I will ask Govind to take over from all of us. Govindraj Ethiraj: Thank you Mr Piramal. So may be the organizers didn’t know: I am somewhat qualified to be here. I first did a ‘Spirituality at the Workplace’ series on CNBC in 2002, much before I think spirituality was main stream, in a way, by media. So the journey continues. Of course I have not had the privilege of interviewing or speaking with Swamiji (Radhanath Swami) here. I have explored this question in some ways, or the set of questions, to do with workplace, leadership and so on for many years. So what we are going to do now is, I am going to ask Mr Piramal and Mr Biyani to speak first to see how to understand – in for a few minutes each – how they relate to the concept of spirituality and leadership from where they stand. I would urge them to be a little anecdotal, share some experiences even if for a minute or two, and in some ways empathize with the theme today. After which I will request Swamiji (Radhanath Swami) to sort of respond to what they have said, as well as lay out his sort of views, rather define the landscape as he sees it and then we can have a conversation. May be we will also involve, even take a few questions. So may I begin with Mr Piramal. Mr Ajay Piramal: Since you talked about anecdotes, let me start with a true story. I am going to give the example of Gandhi Ji. When Mahatma Gandhi was a lawyer in South Africa, he decided very early on that he would only defend those people whom he felt were true and honest, and he would not defend anybody who in his opinion had committed a crime. And if his client… and he made it a rule with his clients that if you are to either say lies to me or in the court, I will give up the practice. So there was this case where he had a very famous client who came and who was standing in the witness box and said something which was incorrect and Gandhi Ji actually withdrew from that case and told the judge that “Sorry, actually my client is not saying what is the truth and I want to withdraw from this.” There was an uproar. Everybody said how could a person like this ever be successful as a lawyer, but Gandhi Ji stood by his values and ultimately you would be surprised, but actually he got even more clients than anybody else. It’s only because if Gandhi appeared before the magistrate, the magistrate knew that in all likelihood that the person was already not guilty and he was innocent. And this is a true story. So in other words if you have values they can actually create even economic value. I can give you an incident, since Govind you asked for it. In our own case we started the pharmaceutical business. We entered it in the eighties by the acquisition of a small foreign multinational in this country. At that time we had made a commitment to them that we would not export any product in the brand name of theirs, because in India the cost of manufacturing was much lower. That was our deal, that we would not export anything and we would keep the quality of the product as any international standards. This both meant that in the short term we had to incur greater cost, and therefore our profitability was affected. But over a period of time because we could create this value based environment of trust, almost every acquisition, and every sale that was done by a multinational to an Indian company was done to us, or we were invariably the first call. And very often we got it at values or prices which were lower than what others in our competition were willing to offer. So in other words, I think if we can, if we practice the values, then I found that actually it created great economic value. May be in the short term it had some loss, but over a longer period of time it was a much more beneficial thing. Another example I want to give is what… Swamiji (Radhanath Swami) keeps teaching us is that how if we focus on the action, the results will follow. Rather than focusing on the results if we just focus on the actions, the results that come out are better. We were doing this transaction where a part of our business we were going to sell to Abet Laboratories which is American company. Actually from Chicago where Maharaj is… original home is. So it’s a Chicago based company. It was a large transaction. After we had agreed upon whatever the values, you go through a legal process. And during the legal process, because the values were large, I think the other side lawyers used to put a lot of pressure on us, that if you don’t do, I think we are gonna walk off from the agreement, and so on and so forth – unless we agreed to certain things which we thought were not in the right interests of our company. In my mind it was clear that we have to do what is right, and if focus on the actions, the results will follow; and therefore rather than getting stressed whether the deal will take place or not, we just remained focused on what we had to do. And that’s what ultimately happened, that the deal got done. And when the deal was done, one of the things that the Abet lawyers and the senior management told me, ‘You all were so cool and composed during the agreement, during the whole negotiation that we felt that that’s what that got the deal done.’ So in other words, if we do focus only on the action then there are better results. I have many more examples and I can only say one thing – that practicing this faith and spirituality in business, they are not two separate things. It really helps succeed. I can go on and on, but I will leave to Kishore to take it on from here. Mr Kishore Biyani: Hello. Yeah. For me I think it has been a really interesting story about me but like… I was virtually a born agnostic or atheistic, never believed in going to temples, rituals, religions. I believed religion was created to tame the animal instinct of human beings until three years ago, when a friend of mine took me to Hare Rama Hare Krishna temple in London. I think the first visit, it was Janamastmi and I didn’t meet Swamiji (Radhanath Swami) then. I think four years ago it was then. Then three years ago, we were twelve of us. We went to the Hare Rama Hare Krishna temple and I met Swamiji (Radhanath Swami). Out of the twelve people, he hugged me first. I thought I am the chosen one. I was going through some turmoil at that time in terms of… we were executing some businesses. He gave me a book, his book ‘The Journey Home’ and from there I think I was on a flight returning from Stockholm or going somewhere and I read that book. I was wanting to understand, out of the nine rasas, I had experienced at most the eight rasas. The ninth rasa was the bhakti rasa which I discovered out of the book and that got me curious about understanding the bhakti rasa and experiencing that. So I used to meet people. 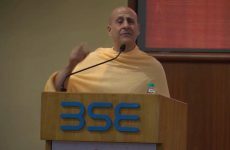 I asked Swamiji (Radhanath Swami) about bhakti rasa. I had interactions with him. He had come home once. My wife’s fiftieth birthday, we did a Pushp Abhishek. After that I have been to Hare Rama Hare Krishna temple four or five times and always I have met Swamiji (Radhanath Swami). It was never designed, but it’s been by again the chosen one. So that book gave me an insight about bhakti rasa and I started wanting to understand more about bhakti rasa. Whomsoever I wanted to meet for that particular six months I used to discuss bhakti rasa and finally my son-in-law Viraj, who is here, he gave me a definition of bhakti rasa is to immersing oneself to experience something much at a higher plain of thought. And probably that is spirituality. I think that’s been there but not that we are not using mythology in business. We have always been advocating that everything which is happening in the world has happened and has been recorded. There’s so much to learn from that and that’s how spirituality came about and I think that spirituality is a inner thing always there. And as a leader in business I think it helps a lot in, like Mr Piramal was mentioning, in taking decisions, in maintaining relationships, in maintaining values and making happy people all around you. I think happiness is what spirituality gives you and that’s what we are seeking, and that’s what we are spreading and that’s what.. I think as a leader of business we influence many, many lives. Today forty thousand people we directly employee, nine hundred thousand people are dependent directly on income from us. I think our responsibility is so huge and I think the aid of spirituality is what keeps you going. Govindraj Ethiraj: Thank you. I think I am going to… before I request you to take over Swamiji (Radhanath Swami), a couple of points I have picked up from the comments that you have made. I think you have spoken about how does leadership contribute to people’s lives and in some ways that place, that Mr Biyani has been saying. Secondly, is the responsibility of leadership. As to quote you, people open their hearts to you. And therefore leadership is not a position to enjoy. And therefore it is a serious significant responsibility of service to others. And that is what both the gentlemen here have been saying. So on that note, let me hand over to you now. Take us through how you see both Mr Biyani and Mr Piranmal said, your own views on what spirituality is in the context of leadership as we see it today. Radhanath Swami: Thank you. Thank you Govindraj, Ajay, Kishore. I am feeling very comfortably out of place. We have two of the greatest, most successful business people on our planet and I have not had a bank account or signed a cheque since 1969. But wealth is something more than just physical acquirements. And this is a universal principle. Often times it’s quoted from the Christian Bible that it is easier to bring a camel through the eye of a needle than for a wealthy person to enter the kingdom of God. And in the Srimad Bhagvatam, Kunti, the mother of the Pandavas, she speaks that the greatest impediments to spiritual progress are having wealth, academic knowledge, beauty and fame. Now in both cases, there is an explanation why. And in this explanation we find that having material prosperity is in a way a disqualification for spiritual life. Rather, it’s a blessing – if we can actually recognize the blessing. Because the tendency is, when one has a lot of knowledge, a lot of wealth, a lot of fame, a lot of power, along with it comes greed. And greed can never be satisfied. The Bhagvad Gita explains it is like putting fuel on fire – the more you give it, the more it becomes aggravated. Greed, arrogance – thinking that I have right over others because I have more – and selfishness. In other words, that aggravates the misconceptions that ‘I am this body and what is in relation to this body is mine.’ But the spiritual principle is to understand that ‘I am not the proprietor, but I am the care taker. And whatever I have, my knowledge, my fame, my influence, it has been entrusted to me.’ And the more that has been entrusted to us, the more we have responsibility. And this is a basic universal principle: to earn with integrity and to spend with compassion. If we actually understand who we really are – an eternal soul within this body and mind – then we can understand how everyone else, all other living beings, are actually our true brothers and sisters. Humanity is a family. When we go beyond all the temporary designations and when we develop this foundation in life, of this realization and experience, then everything we build on that foundation has great benefits – physically, emotionally and spiritually. If a house has a strong foundation, no storm can make it crumble. But if it has a weak foundation, then the storms will destroy it. In life, whoever we are, there will be storms. What will sustain our integrity, our dignity? It requires spiritual foundation, a foundation where we respect that the evolution of humanity is not just how much we can acquire to fill the void within ourselves, but to find the real joy of our own spiritual nature within ourselves and to use our wealth and our knowledge and our power and our influence to share that love, that wealth with everyone. And that’s the greatest legacy we could leave for our children and for the next generation – the values of integrity, compassion, investment – not only in truly making the world a better place through everything we do, but an investment in our lives, in the lives of our loved ones, even beyond death. So there are three principles on the path of bhakti that are very important to help to establish and maintain this foundation. 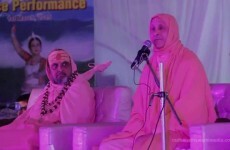 Satsang, Sadhna and Sadhachar. Satsang means associating with people who really inspire us with the faith that there is a spiritual reality within ourselves and within everyone that we should remain faithful to, despite the temptations and fears that come in this world. Sadhna means balancing our lives in such a way so that physically, emotionally and spiritually we are nourished holistically. We give time to our families. We give time to our occupation and we also give time to nourish our own spiritual needs, to connect to that higher power of grace that we can be instruments of. And Sadhachar is the quality of the choices we make in our daily life, to live in a spirit of seva. In essence, bhakti is to take our selfish desires out of the centre of our lives and to put God in the centre. And God is like the root of the tree. When we put water on the root of the tree it automatically goes to every leaf, branch, twig of the tree. So similarly when we put God in the centre, we put our family, our loved ones, humanity and all beings in the centre. There’s no greater joy than the joy to serve with love. That is the spiritual principle. And when I see people like Kishore and Ajay, who are leaders in society, who are taking responsibility to honor that foundational principle, it encourages me so much and I am so grateful. Govindraj Ethiraj: One of the things that you have said is good leaders attract confidence and infuses people to loyalty and faithfulness because of their relationship, whether immediate or extended. This is something that also is a challenge for a lot of people. You know, infusing spirituality into leadership and in the manner that you describe. I mean, from your experiences as you have interacted with maybe Mr Biyani and Mr Piramal here and others, how do you help them navigate this challenge? 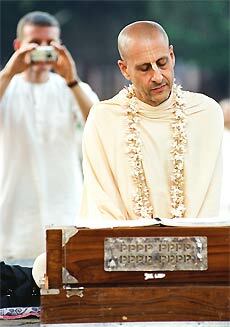 Radhanath Swami: My guru Srila Prabhupada gave a simple formula: How could I best serve? What will actually be pleasing to God in each situation? Govindraj Ethiraj: Mr Biyani, you talked about the forty thousand people who work for you. You also talked about the transition from being an agnostic to appreciating spirituality and in particular in the context that we are speaking today. How did that change your perception of people around you and those who work for you, while running a business? Mr Kishore Biyani: I think as you grow older, your behavior changes, your approach to life changes. You start meeting people. By design of accident, you come in touch with people who talk different things with you. You talk about life, you talk about spirituality… so like going with the flow is one of the value which we wrote long, long time back. When I look back it’s the most spiritual value one can write… like aligning with the nature and going with the flow. So this invitation of the event came and I went with the flow. I had other events to go for, but I think flows. Govindraj Ethiraj: 8 AM in the morning? Mr Kishore Biyani: It was not in the morning, but irrespective of that. The kind of flow that one gets in. So for us the responsibility increases. You start looking at people as your responsibility. Earlier when you are in a creation mode of building a business, I think you are using people as resources. But we are treating them as more humanistic come into play now than it ever has come in. So treating everybody as a human being at a very different level, talking to them about their personal lives, involving them into everything what we do… I think it’s a much much different than what it used to be. So spirituality brings that humanistic into play. Govindraj Ethiraj: I don’t know if it’s a tangential question, but you have had a chief belief officer in your organisation, which is a very unique position. And person also, Devdutt Patnaik, is also someone who has achieved fame for his knowledge of scriptures and Mahabharata and Ramayana. Does this all converge somewhere? I mean, your new beliefs, the fact that you are trying to institutionalize this? Mr Kishore Biyani: I think, the day I met Devdutt, he was consultant. So we brought the mythology out of him, because he was a student of mythology. We thought that mythology can be applied in business. And that’s what we worked towards in many years we worked together. So I think it’s all about associating with the right people at the right time and what the subject interests you. So for me, I pick up a subject every two three years. I work on the subject quite deep. And mythology was one subject, design has been a subject, business, leadership. So one, one subject at a time. So in that sense, mythology has remained with me for a long period of time as a subject. We believe that every outcome of every individual is a result of behavior. And behavior is a result of belief. That’s what chief belief officers come in. Beliefs shape behaviors and behaviors shape the outcome in business, or in life. Govindraj Ethiraj: Mr Piramal, let me put the same question to you. Means, how do you view people around you today? I mean, maybe it’s been always the same, but is that changed? And what is that manifestation of that change, if so? Mr Ajay Piramal: We have business which are in different industries and different geographies. And a few years ago, maybe it was about ten years ago, we actually did have an independent agency look at what they thought were the values we as a group had. And it was not that we had articulated them clearly, but there were some things which we were surprised to find which were really common across those groups. And then we identified them into three – values of knowledge, action and care. Actually it’s nothing but guana, karma and bhakti. But that is the three values and we found that though there were people who were very different backgrounds they all felt that as a group we exercised these values. Because you know you can always put up a value statement on your walls and looks very impressive, but if people don’t believe in it, that’s of no value frankly. And we every year have independent agencies do surveys with people to see that we are living that values. In the values of care, I am just gonna talk about the two things that we emphasize. One is the concept of trusty-ship, that is what even Swamiji (Radhanath Swami) said. When we are there we look upon ourselves as trusties of whatever assets, the wealth that has been given to us… And the trustee’s job is to see that the value of the asset goes up for the benefit of beneficiaries. And the beneficiaries we identify as whether it is our customers, our employees, our shareholders and society. So our job of trustee is not to look at personal gain, but to see how we can enhance the values to each of these beneficiaries. You may be an employee and yet you are a trustee, so you will do things required for an employee. As you will do for a shareholder, but that’s where you bring the balance or the sadachar. 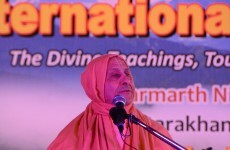 One more thing Swamiji (Radhanath Swami) spoke about sangat. I can’t tell you how important that has been in our whole journey. You know in business, as in life, there is always a slope which is always pretty slippery. Once you get on to that slippery slope it’s very easy to come to the bottom. But you have the association of good people who can tell you that what is right and what is wrong or who can forewarn you, I think we found as that to be very valuable. 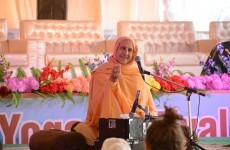 So whether its association of people like Swamiji (Radhanath Swami) but he is at an another level, so its whether in our board of directors, whether it is in terms of our consultants, people who we meet as friends, I think we keep emphasizing that it is this sangat which makes a big difference. And that’s the one which keeps you on the right path. And the other thing which we emphasize is care and humility. Again, we found that if you are humble, it opens the whole world to you, because then everybody is… you can get the best out of people. If you are arrogant, nobody’s gonna tell you what is an another point of view, and again we found that that has been very useful. Govindraj Ethiraj: Quick question. Have you found that, in experience, working or dealing with people who are on same spiritual frequency as you different from those who are not? And do you try and convince people to be on same spiritual frequency as well? Ajay Piramal: You know it’s, these are universal values and I found that almost every religion it is accepted. I think, as I said, we have businesses in the US and in Europe and in Asia and India and I don’t think it makes a difference. And frankly we also seem to attract those people who follow these values. There are others, they may not join you. I am not saying what is right or wrong, we just say these are our values and people realize that. So those people who align with these values, who feel comfortable they come to us. But in the balance, people like to live a value based life. I think they are more comfortable and again what Swamiji said, it leaves a good impression on their kids. Even the biggest criminal wants his son or daughter to be, you know, a good person. So, I think what we are doing they are all derived from our scriptures, but it is universal. I don’t think there is anything…. Govindraj Ethiraj: And we will come to the next generation in a little bit. Swamiji are we therefore saying that there are some cardinal principles, you know, which are universal and there are… But, I am saying, my question is from the point of view of leadership or running enterprises or are there some principles that are constant and there are some which people may, you know, align with or not align with, but that’s ok? Radhanath Swami: When we focus on those foundational principles, then, what we build upon it can be adjusted, but not at the risk of destabilizing the foundation. That is very important, to have core values and then build on those core values. According to time, place, circumstances we may have to make certain adjustments on how we execute. Govindraj Ethiraj: Can you illustrate that? Give us an example? Radhanath Swami: The core value of compassion. Now how we actually express that in a situation of business or politics, whatever it may be according to the place and the circumstance and the problem we are facing? But if we are actually violating that principle of depriving people their rights to life, liberty and the pursuit of happiness, according to the US constitution, and that’s the spiritual principle, then there is something wrong. There we have to really re-examine. And and ultimately, if we clean the ecology of our own hearts, then we will naturally bring that purity, that cleanliness into the world through whatever we do. That is why from a spiritual principle, it’s important that we actually make that spiritual connection within ourselves through our prayer, through our satsang, through our chanting of God’s names, whatever our spiritual practice may be. If we make that connection and in that connection we clean our heart of greed and envy, then with humble heart, we live our lives, we express that. If our heart is dirty, we are not really going to be an instrument of cleaning or purifying the world. So, it’s very important. Children see more than they hear. We can tell them so many things, but unless we actually live by it and the times that children really learn the most to emulate how they are going to in their life is when parents are in a crisis. How do they deal with it? Do they deal with it with anger? Do they compromise their integrity of their principles or do they stand by it? If they stand by these values, these principles, by these spiritual codes even at the time of crisis, that’s going to go so deep within the hearts of the children and the future generations and that’s what the world needs more than anything else is people who have character. There is that saying that – if you lose your wealth, you lose nothing; if you lose your health, you lose something; if you lose your character, you lose everything. If we can teach people by our example, by our leadership, what is character, and then our wealth, our health has incredible value to serve incredible ways in our life and example for future generations. Govindraj Ethiraj: You spoke about the financial, and the soul searching followed that episode. One of the questions, I am sure people as you, typically the leaders from the business world is, can this be institutionalized? Should it be institutionalized? Or is this completely individual personal pursuit? Radhanath Swami: An institution is only really strong as individuals within the institution. So, it should be institutionalized. But it has to begin with each and every one of us taking responsibility to be a part of solution, rather than part of the problem. And when enough of us agree on that, then we can have strong sustainable institutional principles. Govindraj Ethiraj: How do you view the environment today? When you look around you, is this when you are optimistic about, the way people look at spirituality in their lives or are you worried? Radhanath Swami: Govindraj, I am both. There is a polarization in the world. People have a tendency of going to extremes. Extreme greed, extreme sectarian religious conceptions, extreme towards just a life of immediate pleasure, which often breeds immorality, frustration, depression, alcoholism, drug addiction, so many things. I see… and pollution of environment, without really caring about what our real responsibility is to God and to nature and to all living beings. So, there is a lot of negativity. But because the human spirit is inherently good, wherever there is this strong rise in immorality, people question where are we going? And they actually do look for deeper spiritual solutions. So I see a tremendous revival in spirituality. Not in sectarian spirituality that brings about arrogance and hate, but in universal principles of spirituality. In my own life, as a child I saw so much hate in the name of loving God that I came to a conclusion that either I have to totally reject this idea of religion because it was bringing so much arrogance that we are better than you, you killed our savior, something that happened 2000 years ago. So much just attachment to these arrogant conceptions causes us to hate and divide. Either I had to reject it or there must be some common beautiful essence within all these spiritual paths and to the core of my heart, I believed there was a common essence and in my study of all these different religions and faiths and spiritual paths, I found there is that common essence, a transformation of that arrogance to humility, greed to generosity to love, putting God in the center rather than our own selfish egos in the center. And that automatically brings us about a life of compassion and for me it took a serious crisis in what I was seeing everyone around to look for that essence. And I see in the world there is a lot of environmental crisis, political crisis, religious crisis, economic crisis, and that often time leads people to just do anything to survive and to conquer. But the human spirit, it’s also awakening in so many people throughout the world. A desire to go deep into what spirituality is. What real values are? And people want to be an instrument of change. Govindraj Ethiraj: Let me come back to this. You know we have talked about spirituality as a practice and an interesting point that Swamiji made was looking at environment and looking at the changes of environment as a spiritual challenge as well. Do you see similarly? My question is, really, are you in some ways… may be we are expanding the definition of spirituality to what it applies, environment is somewhat perhaps relatively recent phenomenon, but it actually affects our future more than may be ever before? Kishore Biyani: I have a very radical view on this and I might not confirm with Swamiji(Radhanath Swami)here. I will just tell you a recent anecdote. I was, just after Diwali, I was in Maldives for a vacation and one night we decided we will do star gazing. And we went into the planetary system trying to understand everything… we realized earth is one of the smallest planet. We are not even a spec in the whole universal things and actually we are nobody, and secondly as a human being when we look at ends I think somebody look from different view, we are less than ant. In that sense we all create our world and we create the meaningful meaning of our existence. Leaving aside that, for me, the way I look at the environment is very different. We human beings occupy less than 3% of earth. I don’t think so we are capable of destroying the planet. So for me, the spirit of alignment with the nature is more important, that’s aligning with the environment and not to do anything against the flow of nature and that’s what the balance of environment. Environment is the new religion of the world, the green religion is the latest religion created. Or most of the religions we created for businesses or to tame the society. So, I think, this is the new religion, which is created out of fear. I don’t think that human beings are capable of destroying this planet. Govindraj Ethiraj: Same question to you Mr. Piramal. Ajay Piramal: I don’t know how I shall address this. According to me the environment has been always addressed. It’s not a new religion, it’s nothing new, I mean it’s not… I cannot say in front of him. But if you read all the old scriptures, all the God’s, everybody lived in harmony with the environment. You see what the image of Krishna is in the forests of Vrindavan. It is in the… Forests are blooming, there are wild animals sitting next to him, that is environment and according to me that was there all throughout and this is not a new thing. We have always emphasized environment in our scriptures and we have to do that and I mean, you can see the impact of environment every day. I mean, I see how the weather changes, it rains in Bombay in November. There is something going wrong. Govindraj Ethiraj: And it’s warm. Kishore Biyani: No, no. I think we have recorded history of only 150years or 100years. So we don’t know whether it happened earlier. So somebody is creating this fear in us, this is happening because of that. Govindraj Ethiraj: So, my question to you Mr. Piramal. So since you are in chemicals and pharmaceuticals, or have been with chemicals and pharmaceuticals business, you are also in some ways, I mean, some of what you or by product of it has an impact on environment. Is that something, if I am not stretching it too far, is that something that you would today look at from a spiritual lens or through a spiritual lens, this concerns people in the external environment too? Ajay Piramal: You know, I don’t know whether you call it spiritual or not, but we really believe that our purpose of our organization and we believe, it’s not just us, is to do well and to do good and to make a positive difference to the world around us, and that’s what we do. And if we feel that whatever we are doing for the environment, if its doing good and it’s making a positive difference that’s what we will do. And that’s what we believe in, and so we try to live it. And it is easy to say things and again Swamiji(Radhanath Swami) said the same thing, people don’t in your organization and outside people will not believe in if I just keep on lecturing. They have to experience it and that’s what we try to do. So, for instance, the person for health safety and environment is independent of all our CEOs and goes directly to the board to ensure and who is conscious of what’s happening and would raise issues. So we believe in that. Govindraj Ethiraj: We are going to go to couple of quick questions after this, but back to you Swamiji(Radhanath Swami). So, you have also talked about you know, one is the discussion that we are having and second the challenge is how do you sustain this because this should not be a discussion one morning and then it fizzes out. What are the challenges there that you have seen people going through and how would you guide them through that? And second, in some ways which is extension is the next generation which we touched upon earlier, how do these principles get transferred to the next generation? Radhanath Swami: Every day we eat food and we sleep because we need that nourishment and that gives us strength to go through our day. If we have a theory that the more I work the more I will progress then I shouldn’t eat or sleep. That could be sustained for some time but eventually we become weak. So we have to balance our life. So similarly this satsang, sadhana and this sadachar. To actually pursue the true values of human life we need to have that harmonious balance where we give time to invigorate and nourish our spirituality and with that strength we actually can have integrity to perform our work in such a way that we are progressing towards our real ideals. This is very vital. When my Guru, Srila Prabhupada was in London in 1969, a journalist asked him, “Why have you come to England?” And Srila Prabhupada responded, he said, “The British had controlled India for almost 2 centuries and during that time, British plundered so many of the riches of India – jewels, gold, so many facilities – and brought it to London. But you forgot the most important wealth of India – its values, its spiritual culture. I have come to London to give you what you have forgotten to take from us.” What India represents to the whole world is a very deep profound spiritual culture and it’s quite incredible. When I look at it from an objective perspective, so many religions from so many parts of the world, for so long have lived in freedom and harmony to a large extent in India more than anywhere else I have ever seen. Because, there is a foundation of a deep culture of values. It’s very important that we give our children this. And we can only give them if we really appreciate the value and culture of the spiritual heritage of this great land and live by it. Then we can give our children actual happiness. There is a saying – that in an evolved human society loves people and uses things but in today’s world, all too often, people love things and use people to get them and keep them. There can be no inner satisfaction in such a life. It’s that conception that creates sectarianism, division, castism, ecological pollution. We have to find that love within ourselves and value people and then all the things of this world, whether little penniless Swamijis or whether billionaires or millionaires, we can all work together just like the human body. Within the body, there are so many organs. They have different colors, they have different shapes and they have very different functions. The kidneys cannot do what the brain does, and the heart cannot do what the pancreas does, but every part of the body is not arrogant that I am better than you. Everyone is doing their duty for the whole health of the whole body and in the same way in all of our different positions, in all of our relationships, in all of our roles, if we see how we are all contributing to the whole of society in devotion to God then we can have a healthy spiritual body. And when the body is healthy every part of body is healthy with it. I think this is the real legacy of India, the real legacy of spiritual principle of all great spiritual paths, and if we could give this to our children, our grand-children, we have really made a tremendous, beyond material value, we have made a contribution to the world. Govindraj Ethiraj: Question. Yes mam, short question please. Question: In regard to the passing on to the generation, the values and the principles. How do we explain a situation where two siblings have been brought up in the same family, live with the same values, with the same environment and yet the two are having completely different set of values in their behavior? Govindraj Ethiraj: May we collect a few more questions and then we can ask? Yes. 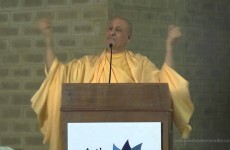 Question: Swamiji (Radhanath Swami), you talked about the spiritual strength of India, and its culture. While it’s very true, but what we find today is the various religious leaders and politicians exploit this spirituality and create more dissentions within the country in spite of the fact that our strength lies in our spirituality and culture. Our supreme mother and father comes again and again and again to teach us by his example, his words, what’s best for us and how to actually live in harmony with ourselves. And when we live in harmony with ourselves, we could create harmony in the world. And that’s where all the great spiritual paths have manifested from that principle, from our father coming to this world to teach us through life and through teachings. And as mothers and fathers, our children always have free will as we have free will. And we cannot control that. But we can do the best in our role to inspire the right values. Whether a person accepts it or not may be beyond our control, but our life is perfect when we embody the right example and that’s our true compassion – to be an instrument of this higher power of compassion within ourselves. And naturally, some people will find religious leader, how is it that in every great religion there are followers of same scripture and the same avatar who are living with compassion with humility with devotion seeing equality of beings and in same religion there are people who are exploiting for their own power for their own prestige for their own, creating division and hatred. That’s human nature. We should never be discouraged; we should live by trying according to our capacity to embody the real values. Does that answer your question and I think the same answer for yours. People try to exploit anything if they have exploitative ego, whether it’s in name of politics, whether it’s in name of capitalism or socialism or atheism or agnosticism or religionism, whatever it may be, if we have that selfish ego, then we are going to try to exploit it for our own individual or collective purposes. The whole purpose of a spiritual path is to rise above that selfish ego. But unfortunately people use the same tools which are meant to rise above the selfish ego as weapons for the ego to conquer others. Like a knife. Is a knife good or bad? If it’s in the hands of a surgeon, it saves life. If it’s in the hands of a thief, for that person’s selfish interest, it destroys the life. Wealth, religion, influence, power; it’s all like that knife. It is as good or beneficial or harmful as the motivations of the persons who are using it. Govindraj Ethiraj: Few questions. This is, I think has come via twitters. What according to you is the most important indispensable trait of a successful leader? And somewhat linked to that… people generally are more interested in understanding the traits of a leader, what about traits of a follower? Radhanath Swami: To be a food follower is pre-requisite to be good leader. Humility and gratitude are very important. To be grateful for the gifts that we have received, and to be humbled by the opportunity to use them, I think are very very foundational to leadership. Radhanath Swami: yad yad acharati shreshtas- Krishna tells in one verse in Gita that what leaders do,the common people will follow. So, in whatever field we are leader, a mother and father is leader of the family, a teacher is leader of students, a politician is a leader of nation, in business whatever particular role we have, if people are subordinate to us then we are leaders. We all have serious responsibilities. For one whom much is given, much is expected. So, where we have leadership… on some level or another we are leaders. It may be small leadership, but that is not really important. What is important is quality. We take responsibility of our leadership by imbibing the spiritual principles and satsang, sadhana, sadachar is a beautiful formula which makes it all possible. Govindraj Ethiraj: Thank you Swamiji (Radhanath Swami). Yes, last question. Question: Thank you Swamiji (Radhanath Swami). One question which relates to, to be successful one has to beat competition, are there any spirituality principles for competition? Radhanath Swami: Competition is good if it is good. Like that example of the knife… or I will use another example, morphine. We have a hospice at Bhaktivedanta hospital at Mira Road. So to improve quality of a person’s life as they are dying, morphine could be helpful. But that same exact drug, certain dealers are selling to our teenage children to addict them and to destroy their lives. So is morphine good or bad? It depends on who is using it. So similarly, competition, competition could actually be the incentive to really go beyond the call of duty, to make something successful. It’s a glorious thing providing we have principles. We have certain lines we will not cross, and those are those foundational principles and integrity. If competition is performed with values and integrity it has a sustainable effect to actually bring about a better life and a better world. But if in the name of competition we cross the line of integrity then we create a terrible example that will become the standard what people or the next generation feel is the norm. Govindraj Ethiraj: I think there is someone in the back. Just one question, and then we will close. Question: Swamiji (Radhanath Swami), good morning. My question is for you and Piramal both. Sir, in today’s world the definition of business has changed. If you are subtracting value, yet you could be in a good profitable business. Piramalji was in the business of pharmaceuticals and as I understand, it’s vested in someone’s sickness. If somebody is sick you make profit out of it. Can’t this business be vested in wellness, where you make money when the mankind is happy and healthy? Govindraj Ethiraj: Question for you, I think first. Ajay Piramal: So, I think lets understand what the pharmaceutical industry does. I think we are alleviating the burden of disease. We can talk about wellness, but I don’t know in your family and around there must be many people who tried to be well, but yet they have diseases and only drug can cure them. And look at the numbers. Why the longevity in world has gone up? Today if you have somebody who lives till 70, who dies at 70, you say he died a bit too early. 20, 30 or 40 years ago you would have said that he lived a reasonable life. So would you have done without a medicine? I don’t think that is possible. But wellness is also important. It’s not that we all have to live well, but it doesn’t mean that that is the only way to live. I mean I think so, it’s pretty obvious to me today, longevity is 85year old today. And in Japan it is increasing, people are saying they live beyond 100. It’s only because of modern medicine I think. Govindraj Ethiraj: Would you like to respond? Radhanath Swami: If you ask a Swami about medicine, he is going to give a different type of answer. Anechi-aushadi…magi, the core disease that we have is forgetfulness of our true eternal nature that we are beyond birth and death, we are not black or white or red or yellow or brown, we are not Indians or Pakistani or Americans or Russians or Africans, we are not Hindu, Muslim Christian, Jain, Parsi, Sikh, agonistic or atheist, we are not businessmen or Swamis. We are all eternal souls, playing these different roles and the disease is we are forgotten who we really are. And under the spell of this arrogance or this ego or this Maya, we are creating so much bad karma for ourselves which cause suffering. And we are propagating that same culture within the world around us. So the medicine in this age of Kali according to the Vedic literatures is the chanting the God’s names, to actually clean that disease of ignorance from within our hearts. And that is, from the spiritual perspective, and to live in such a way that seva, prayer, devotion, this is medicine for the heart. And as far as pharmaceuticals, if we base these principles on this… because I know Mr. Piramal, I don’t know so much about how his business runs, but I know, my God! He does, he and his family does such enormous good for human society. They have principles of integrity that they work and live by and with the wealth that they earn they use it so much to feed tens and thousands of people in ghettos, in educational institutions. They are trying to utilize for a good purpose because they have these values and I think the medicine is very healing for the whole society. And Kishore is also, the same principles, striving to live by. And I think it’s the example of these two people is very medicinal for the wellness of the humanity. Govindraj Ethiraj: Thank you. Mr Biyani, closing comments for a minute or so, what you have taken away from this. The climate change discussion we will continue next time. Then we will come back to Mr Piramal for a closing word. Mr Kishore Biyani: I think for me the closing remark should be that I got medicine for my soul today. Govindraj Ethiraj: Thank you. Mr Piramal, closing comments. Mr Ajay Piramal: Difficult to match after that. I think it has been a very interesting conversation and I don’t think both are separate. But you can’t separate business and spirituality. You cannot separate, but today’s life and spirituality; it’s all a part of one integrated thing and if you have to be a better human being, all these things are required and that balance which Swamiji (Radhanath Swami) spoke about is really essential. Govindraj Ethiraj: Thank you very much. Mr Kishore Biyani: On a lighter note, a person with a debit balance, a person with a credit balance and no bank account here.